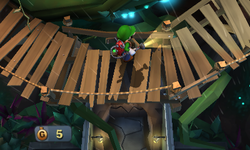 The Crow's Nest (known as Walkway in the PAL version) is an area outside the Haunted Towers in Luigi's Mansion: Dark Moon. The Crow's Nest can be accessed by taking the door on the right inside of the West Hall or the left door on the fourth floor of the Conservatory. This area is a long bridge connecting the West Hall and Conservatory. It overlooks the Hollow Tree, and as its name implies, is home to many crows. This area has a fifth floor that can be accessed only by using a Bulb in the Conservatory. There is a hole to the west that can be investigated to get a glimpse of the West Bathroom. The door on the left takes Luigi back to the West Hall while the door on the right takes him to the Conservatory. In B-4: Pool Party, Luigi must cross the Crow's Nest to go into the Conservatory. From the Conservatory, Luigi should make his way to the fifth floor and reveal the portrait of the key using the Dark-Light Device. This key is used for the West Bathroom. In B-5: Doggone Key, the Polterpup crosses the Crow's Nest and enters the West Bathroom. This page was last edited on August 11, 2018, at 09:20.